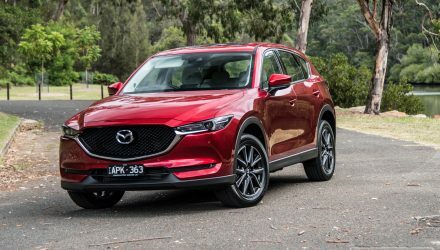 Mazda is now the second most popular car brand behind Toyota (year-to-date, through July), offering Australian buyers a number of well-equipped, superbly-designed, dependable, and great value options. 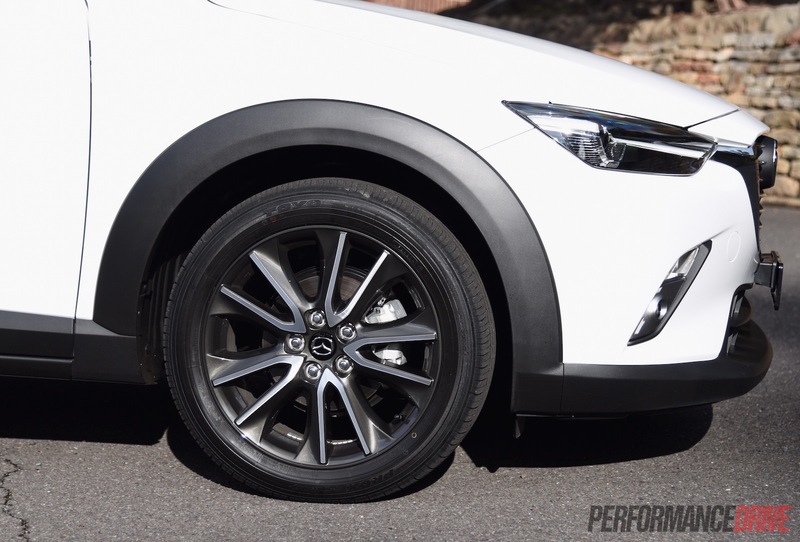 How does the CX-3 sTouring fit into the range? 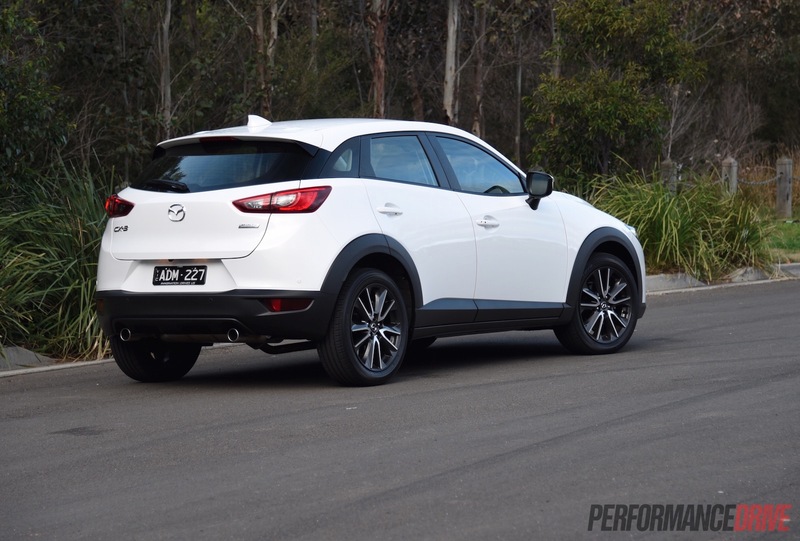 And should you go for the petrol model or the more economical diesel? 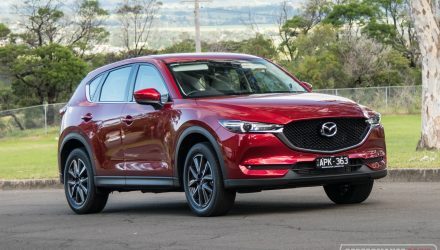 In Australia the CX-3 is offered in front-wheel drive, all-wheel drive, 1.5-litre turbo-diesel, and 2.0-litre petrol form. These are then divided up by Neo, Maxx, sTouring, and Akari trim levels. Yes, the lineup is a tad overwhelming. 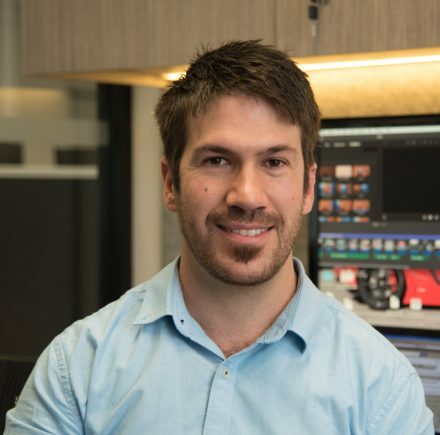 But look at it this way, with lots of variants available it means you’re more likely to find the right package in your budget with the equipment and style that you want. Last month when we tested the diesel Maxx variant, we walked away fairly impressed by the interior design and the sheer level of standard features. Jump up a variant rung into the sTouring, and it is equally eyebrow-raising. 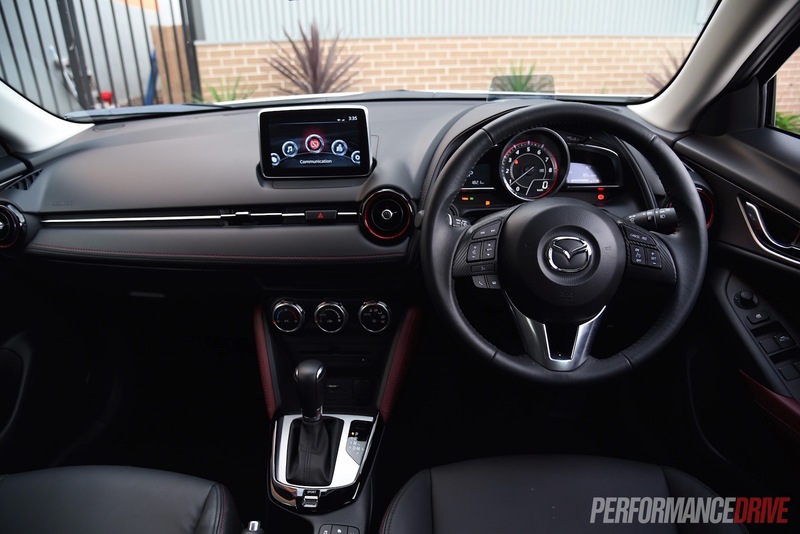 You get a leather-style ‘Maztex’ trim with cool red sections on the door cards that match red-accented air-con vents, and red-trimmed beams that support the centre fascia. There’s also tasteful fake carbon fibre trimmings throughout. It’s classy, sporty, and stylish all in one. 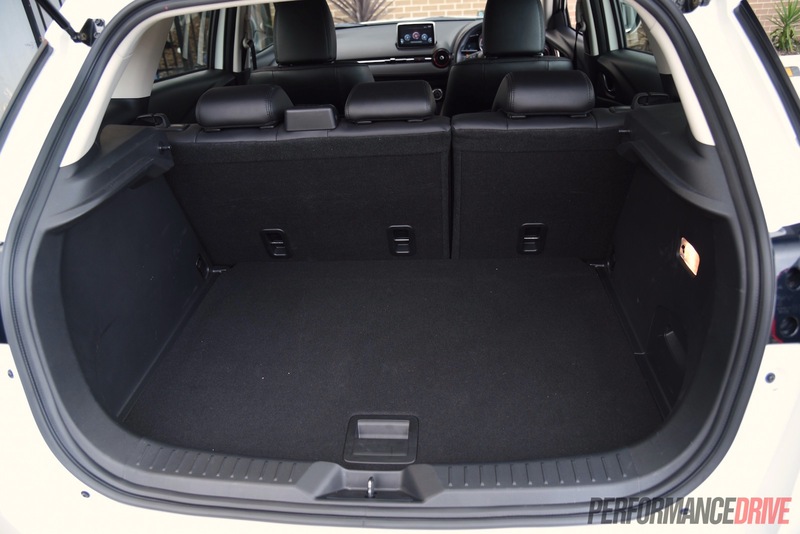 The front seats are really comfortable, with soft back sections and decent-size side bolsters to hold you in during playful turns. Seat space isn’t enormous, but for the segment, it is totally acceptable. 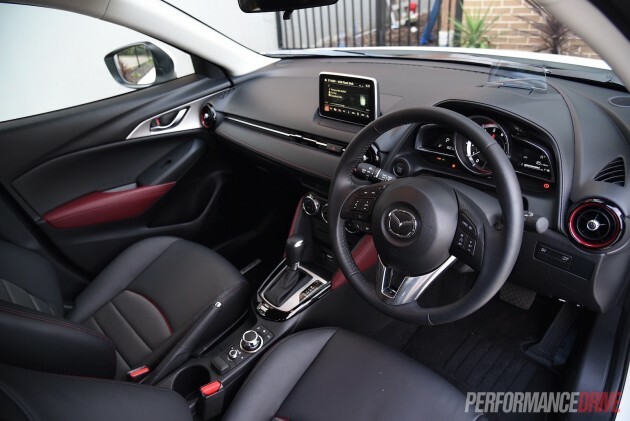 Front passengers will be most comfortable, with ample ceiling leeway and plenty of space to move about. In the back it is a bit tighter and somewhat claustrophobic, with really only proper seating for two adults due to the narrow width of the vehicle. Middle-seat passengers are likely to try and argue you their way into the outer seats, especially during longer trips. Both headroom and legroom are marginal. 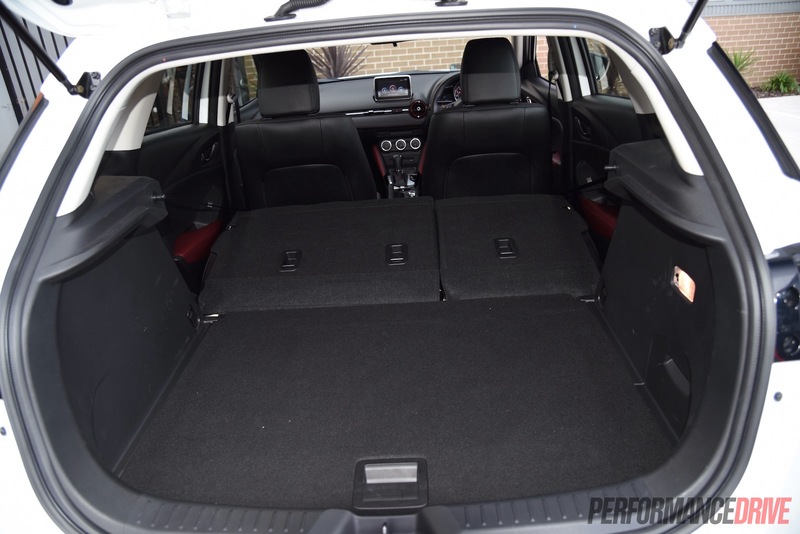 Cargo space is not one of the dominate features of the CX-3 either, with 264 litres, or up to 1174 litres with the rear seat down. It is best that you do not try and pick up your next big flat-screen TV with this vehicle, put it that way. 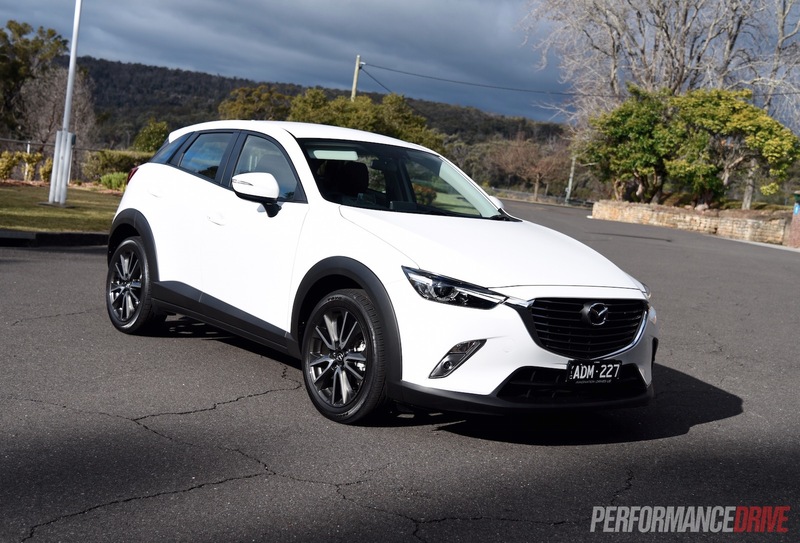 In saying that, if you live a single lifestyle or have a small family, the CX-3 is adequate for your weekly shopping and daily errands. The payoff to the small dimensions arise when you enter the inner city. More on that below. In terms of equipment, the sTouring comes with a 7.0-inch LCD infotainment system with a rear-view camera and sat-nav as standard. 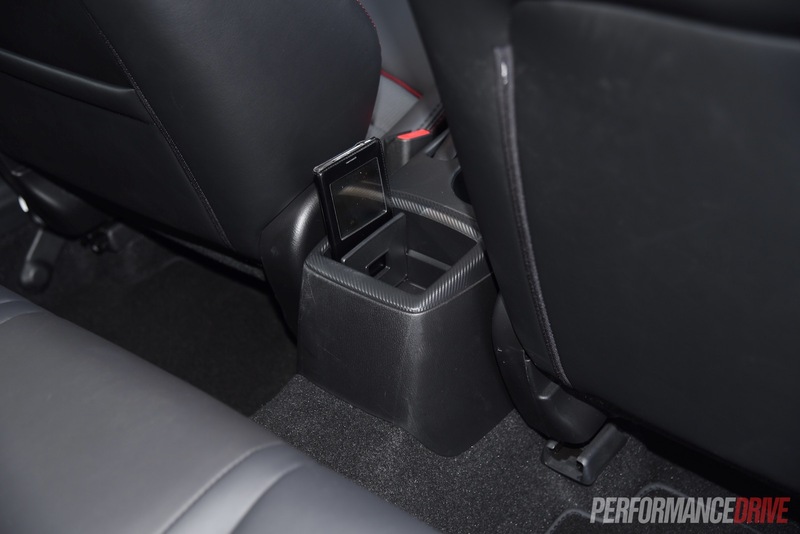 However, even the Maxx comes with these must-have modern conveniences. 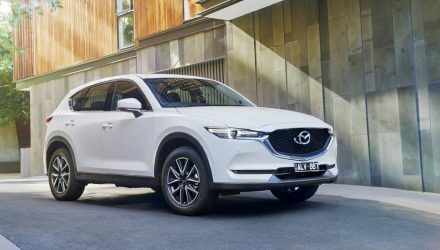 On top of the impressive features of the Maxx, the sTouring adds auto headlights (LED) and wipers, climate control, and head-up display on a futuristic little pop-up perspex panel. 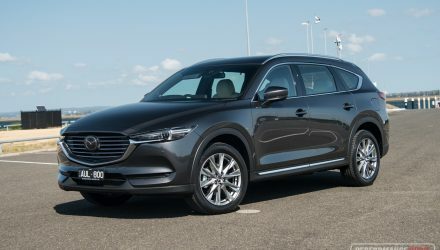 On the outside the sTouring gets sporty 18-inch alloy wheels wrapped in lower profile 215/50 tyres (compared with the Maxx). You also get LED daytime running lights, LED fog lights and taillights, and keyless entry. 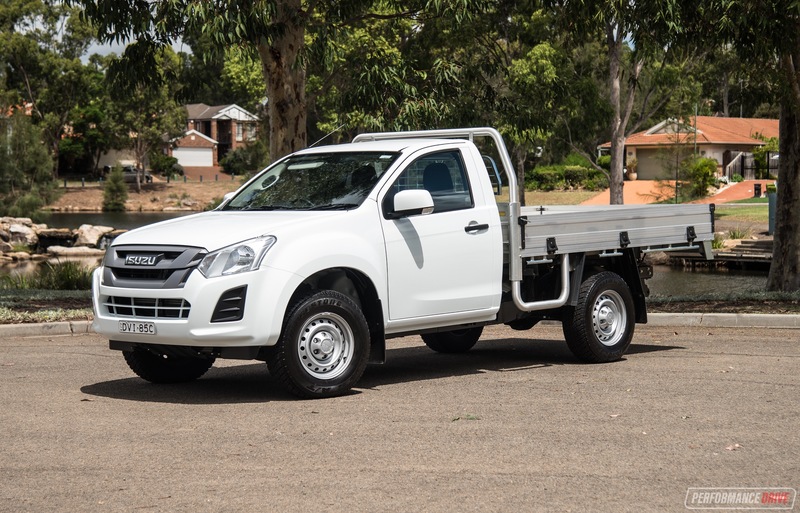 With all of this kit, the sTouring is an extremely well-equipped vehicle for the price. As we touched on above, the CX-3 seems like its home ground is the city. It is so nimble and agile to zip around the small streets of a city. 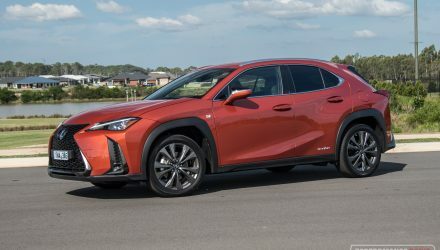 The external proportions are very easy to predict and you can adjust the seat for a commanding driving position, although don’t expect a full high-riding SUV stance. Feeding around the light steering is enjoyable and there is plenty of feedback. Up the pace a little out in the mountains or on a country road and you’ll be glad you picked the sTouring. 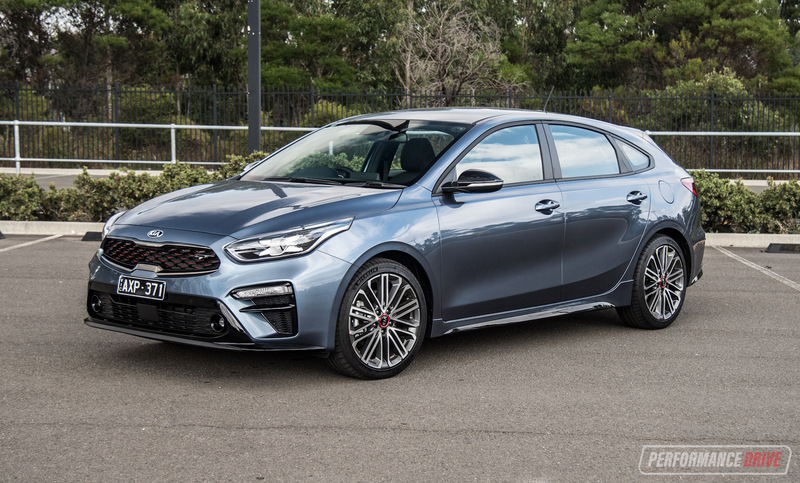 We did have a minor qualm about the stability and road-holding of the Maxx, but with the sporty wheel and tyre package of the sTouring the tiny issue seems nonexistent. In terms of the powertrain, the 2.0-litre petrol engine is rather noisy higher up in the rev range. We put this, at least partly, down to the high compression ratio of 13:1. 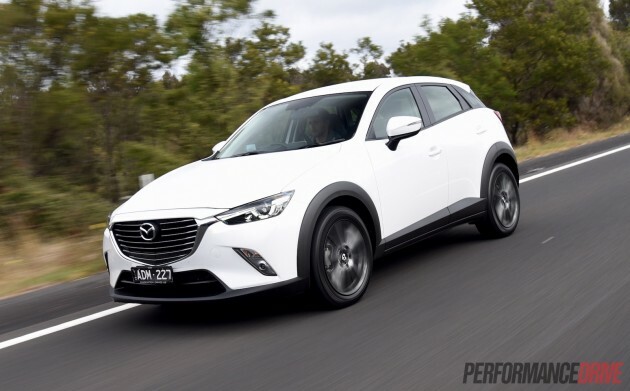 This is all part of Mazda’s ‘SkyActiv’ technology philosophy. 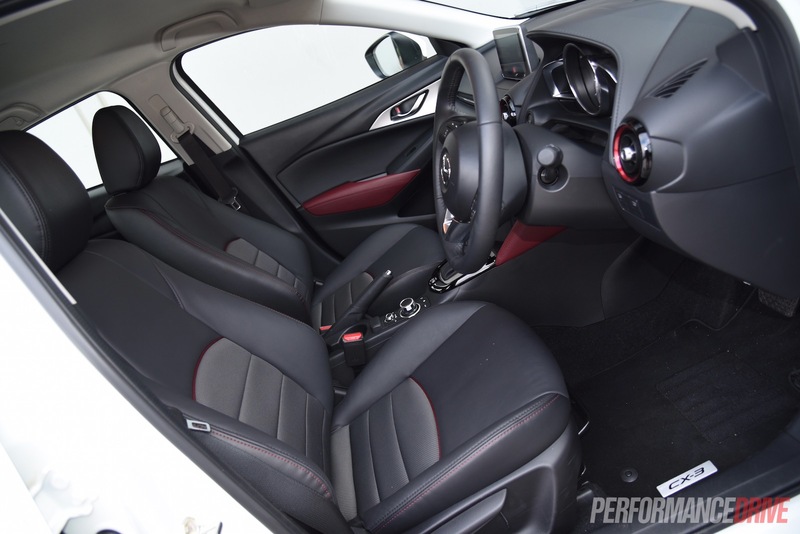 The engine is quite highly strung and offers good efficiency and excellent low-down torque for a non-turbo. Peak power (109kW) is reached at 6000rpm, while peak torque (192Nm) comes in from just 2800rpm. Out on the road this means it doesn’t necessarily need to be revved high to get anywhere, similar to a turbo-petrol or even diesel. 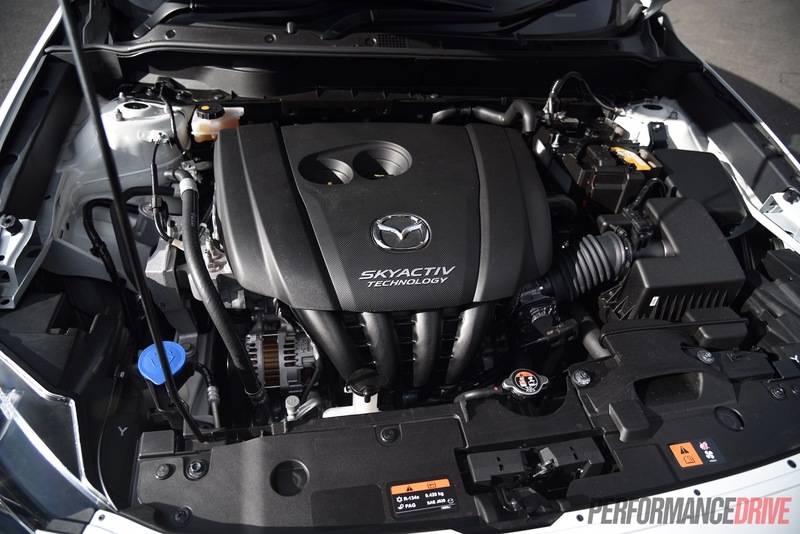 However, the transmission and engine computer do have a tendency to allow the engine to rev willingly. This is where the noisiness becomes apparent. 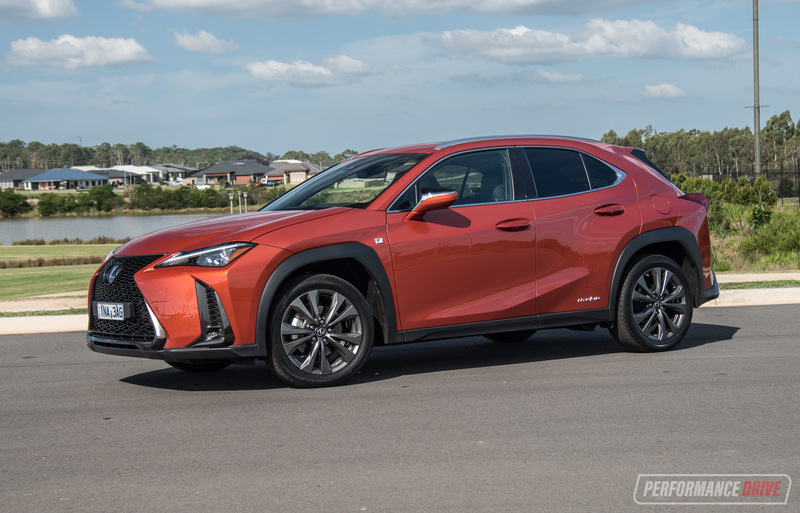 Both the engine and transmission seem to work in perfect unison though, with quick changes and a general ‘right gear for the right job’ attitude. 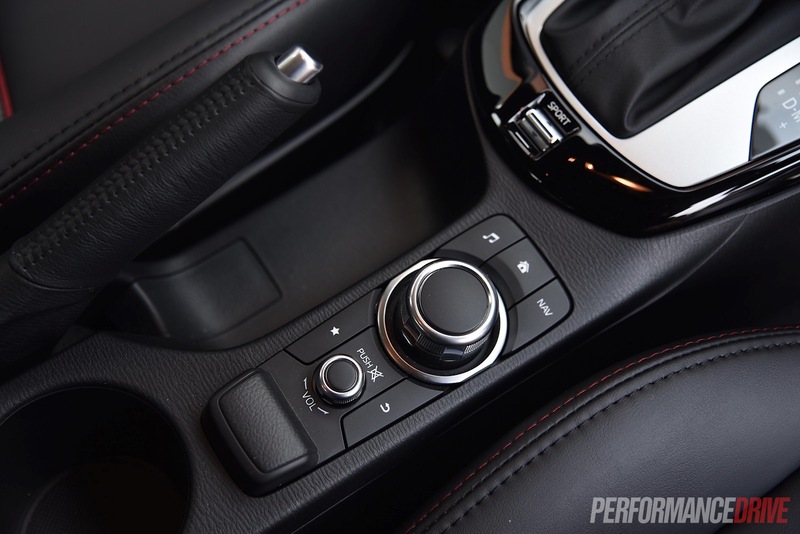 There is a ‘sport’ driving mode which makes power delivery more responsive. Flat out, we timed 0-100km/h in 8.8 seconds. 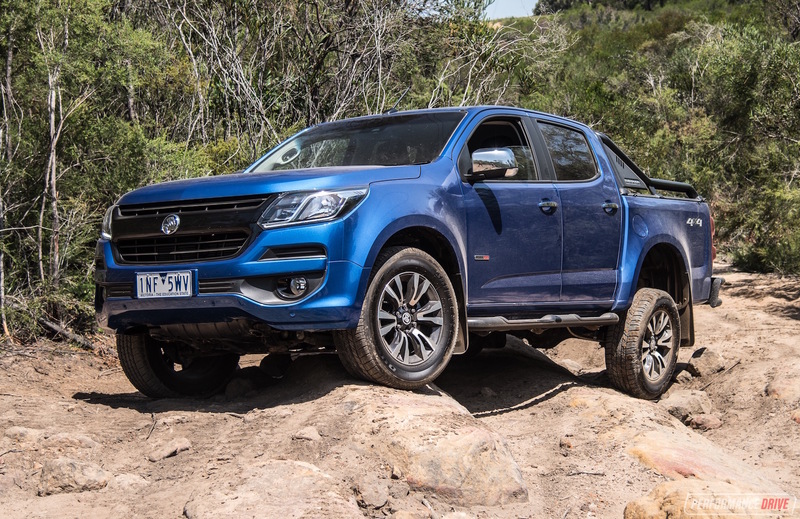 This is quite a lot quicker than the 10.6-second time we achieved in the front-wheel drive Maxx diesel. Of course, the downside to the petrol’s performance is higher fuel consumption. On paper, the petrol uses 6.1L/100km on the combined cycle while the diesel sips just 4.8L/100km (both FWD spec). In the real world during our week-long tests, the official figures do reflect a similar pattern. We recorded 7.7L/100km in this petrol, and 6.2L/100km in the diesel. 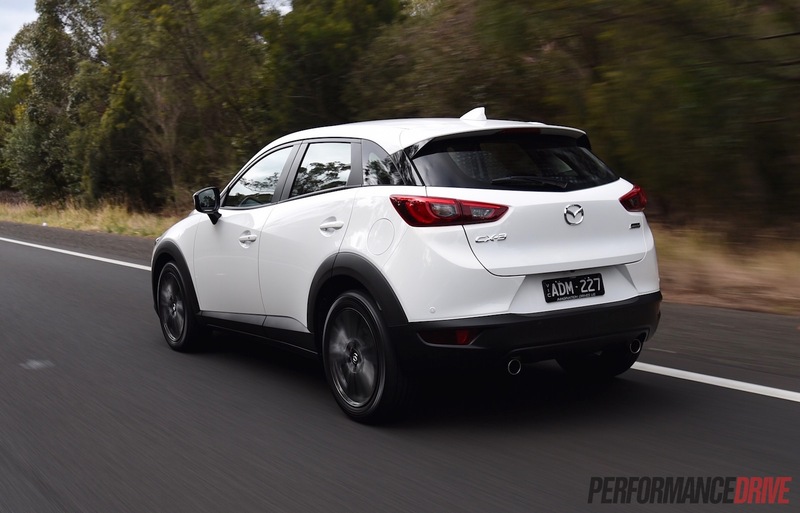 The CX-3 is at the pinnacle end of the pokey and fun compact SUV segment, there’s no doubt about it. It’s not so much a case of should you buy one. In our opinion, the pressing matter is which variant do you go for? 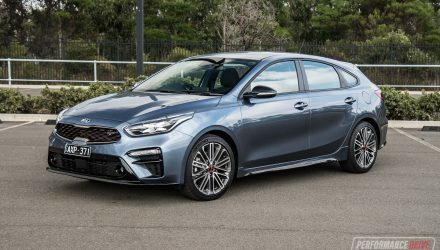 You need to have a think about what functions you absolutely need and what luxuries you really want, and then work out the best trim level to suit your budget. 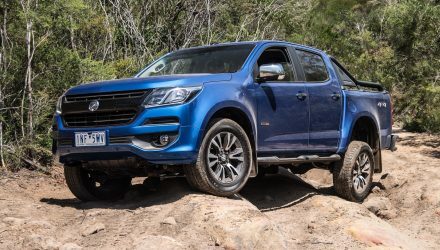 Unless you’re planning on tackling off-road tracks or heading to the snow regularly, we’d pretty much rule out the all-wheel drive options as they are more expensive. 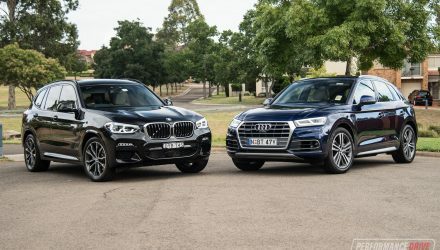 As for diesel or petrol? Well, both of them have their good points. 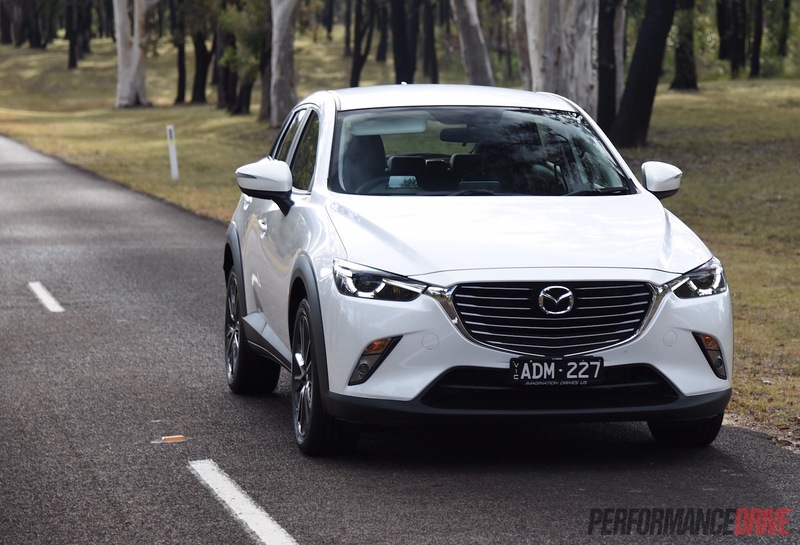 If you’re really concerned about performance then the petrol is surprisingly flexible. If economy is more important to you then it has to be the diesel. It also seems quieter at some points of the rev range, and offers stronger torque (270Nm versus 192Nm). 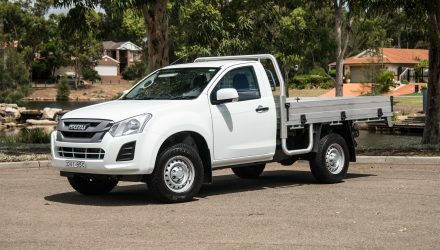 Our money would be on a FWD diesel in Maxx trim ($26,790) as it comes with plenty of kit as standard yet it is in that ‘compact car’ price bracket.